Restored Family History complete with clamshell box. At the time of transcription, the original copy the Family History was in a state of some distress. Acidic paper and cover material caused yellowing pages, crumbling spine and severe deterioration of the binding; this is normal for paper matter from the 19th and 20th centuries. 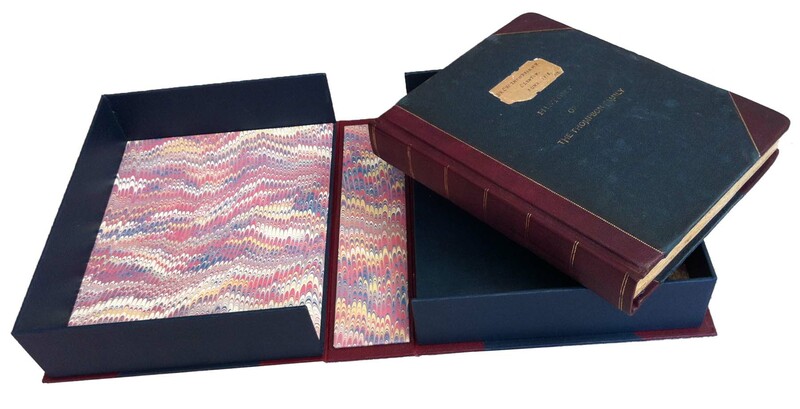 The original book has been restored and stabilized by Natasha Herman of the Redbone Bindery (Amsterdam), with the ultimate intent to deposit it with the Lennox & Addington Museum and Archives of Napanee, Ontario where it will be stored safely in suitable conditions, close to the Thompson family’s point of origin in Canada. This entry was posted on October 15, 2013 at 1:54 pm and is filed under Uncategorized. You can subscribe via RSS 2.0 feed to this post's comments. You can comment below, or link to this permanent URL from your own site. Very interesting. How wonderful to have a family history like that available to you! It’s a treasure, really. There was concern over the years about what would happen to it; in just over a century, the family has become fragmented enough to lose track of five of the seven copies, although one more, Gertrude’s, has come to my attention as a result of these posts. It is safe in the hands of descendants. All in all, a satisfying and worthwhile project. One must become carefully with tasks like to these; I drew a sharp line around transcribing and reproducing the text, and not taking on any new genealogical tasks or responsibilities. For me, that would be a particularly deep rabbit hole to leap down right now. Thank you, so very much, for your postings. (Sarah) Julia (who never married). Thanks again Susan. Great feedback! Larry: Thanks so much for sharing this online. I was excited to find your blog only today. My family is the Greene family of Swords, Co. Dublin. Charles Walden Thompson’s wife, Mary Louisa Greene was the granddaughter of Richard Greene who came over to Canada from Ireland with his wife and infant daughter. Are there any more copies of the book available? I would love to own one. I was aware that Joshua Thompson had written a family history but had never seen it.